Hyperlinks are what connect web pages together on the www. Once you really understand that, you start to see why links are so important in creating a website – the links within the site linking the pages together and the links from other sites that go to your site are what make the www possible. People click on links and follow them through the internet. There are programs that automatically scan the web for hyperlinks. The process of following and retrieving documents on the www is called crawling and the search engines have programs called “Spiders” or “Bots” that do the crawling to find websites. The Web is a collection of interconnected documents and other files that are linked together by hyperlinks. Search engines are in the business of finding websites and organizing them by keywords. They search the web for websites and follow the links to more and more websites and also keep an index of these sites on their servers so that when someone does a search they already know where it is. That is why search results are able to appear very quickly when you do a search. Search engines start with websites that are the most popular and follow the links from there on down. The spiders/bots return every so often to check up on the websites and their links. The more popular your website, the more often they come back to visit. Communicating with spiders/bots is an important part of getting your website found online. The spiders look at specific parts of the document to find out what is on your website and file it according to hundreds of variables that are kept secret so that no one can really know how they work. Today search engines are getting much smarter and are moving toward looking for meaning and context. We start at a set of well-connected initial pages and follow each of their links to new pages. Then we follow the links on those new pages to even more pages and so on, until we have a huge list of links. See how Google Search Works. 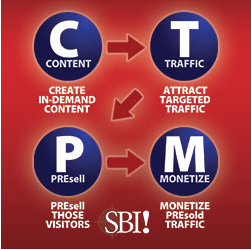 Content> Traffic>>> Presell (build trust) >>>> Monetize. As you create a website, keep in mind that the goal is to be found by the search engines. Today, the best place to be is at the top of the first page of the search result or at least somewhere on the first page. The way to do this is to follow the C> T > P> M process. Write/create Content. Content is everything and anything – written, video, podcasts, images and any combination. The more content you have the bigger the target you have. Think about what a search engines job is – they are in the business of finding the best websites that match the searchers query. To decide which website best fits the search terms the look for the best websites – one that answers the searchers questions and gives them a solution to the problem they have or gives them the information they want. The more good to great content that you have, the more people will know that you are THE expert in your area on massage therapy which builds trust. When people find your website all on their own through search, you have already conquered half of the marketing battle. You have found people who are already interested in massage therapy. You don’t have to convince them or educate them on the value of massage. You don’t have to sell them on it. They already VALUE massage therapy. Anything else like social media is really hit or miss. Having the advantage of getting people to your website WHO ALREADY are looking for and want a massage in invaluable. People who find your website on their own through search are less skeptical than someone finding you through an ad where they know they are being sold too. A reader/potential client who finds the information that they are looking for or sees that you know what you are talking about are more likely to make the appointment without any further convincing… and that means less time, energy and money spent on client acquisition. I know you hate writing content and just want to give massage. If you are like most massage therapists, you are probably already exclaiming – I don’t know how to write. I don’t want to write. I just want to give massage. I don’t want to make videos, podcasts or any other content. I am sure that I can just open my office and people will find me….after all I am giving the best massage they will ever have in their life. Being in business often means doing things you don’t want to do. This is one of them. Just think of it this way: Just write down the same things you would be saying to clients or potential clients if they were on the massage table or if they were calling/emailing to ask you questions. That’s it. Simple right. I know. Still too overwhelming. Just start where you are at. Use pen and paper to start with if needed. Write down some things that you say to clients each day. Write down some of the things that they are always asking about. Here is a really big list of possible ideas for content for your massage business website.